Whenever Loic Le Meur, the founder of Seesmic and Le Web conference in Paris, organises something in his native France you can be sure that it will sell like hot baguettes. 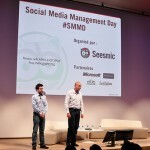 Which was exactly the case for Social Media Management Day on 6th April – a half-day free conference held by Seesmic (which was represented by Loic (@loic) himself and Cedric Giorgi (@cgiorgi), Seesmic Europe Director). 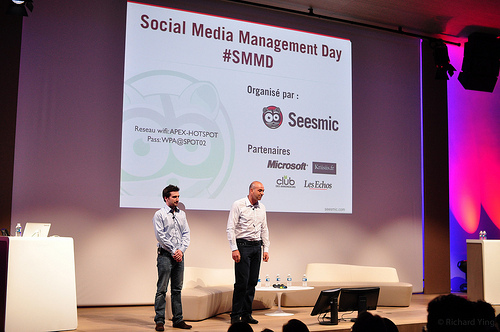 Over 400 participants, most of them social media pros and community managers, gathered in the impressive Microsoft France venue to listen to representatives of some of the biggest companies in the country (France Televisions, Air France, Orange, Microsoft, Canon, La Poste, Schweppes/Orangina, Ben & Jerry’s and others) sharing their social media practices and insights. In the organisers’ own words the aim of the event was to provide “hands-on expertise on how executives at big brands manage social media” – and also to hear it directly from them, and not the agencies. This practical orientation of the event (apart from Loic’s celebrity status) was probably the main attraction for the audience eager to get something beyond the usual phrases about engagement, authenticity and ‘being everyone’s true friend’ repeated endlessly at numerous social media events… So, did we get it? Not quite sure how much actual value this sort of nuggets really bring, but it’s always interesting to take a peek behind the closed door of a big company’s marketing department – even if the visit is closely guarded. Besides, Facebook France was also represented (actually is there any respected social media event nowadays without a speaker from Facebook?) – and it’s always good to hear vital statics and updates straight from the horse’s mouth. Speaking of Facebook, I was actually rather surprised to hear the speakers talking 90% about Facebook and Twitter – as if social media were just that. Other channels were only mentioned when prompted (with YouTube taking the lead) and it was only Michel & Augustin (a small French FMCG brand with a cult status comparable to Innocent in the UK) and Orange who gave some deserved airtime to blogging. The latter was represented by Yann Gourvennec of Orange Business Services who in my opinion provided some of the most valuable insights plus some memorable quotes of the day (“To buy fans = to buy love. This is called prostitution and it doesn’t work” or “There is no such thing as social media strategies, there is only tactical adaptation of a global strategy”). Judging from the audience’s questions and numerous tweets (#SMMD1), there were two things that everyone really wanted to hear about: tools and budgets. Yet contrary to organisers’ promise there was not too much talk about the actual tools used – apart from the separate session about Salesforce Chatter (a free internal social network for enterprises which looked interesting enough for most of the people I spoke to plan to try it out), somebody mentioned Socialbakers and that was pretty much it. The budget question was (as could be expected) answered without giving the actual numbers: 10% of marketing budget and “cheaper than TV” (go figure!). However, I did have the impression that the atmosphere was quite open and convivial (at least as much as it can be when big companies are revealing their “secrets”) and the discussions following – sometimes quite daring – questions from the audience were very animated. All in all it was an interesting afternoon in a unusually relaxed atmosphere and I did come out with a much better sense of how social media “the French way” is done. In his closing speech Loic Le Meur implied that there are plans for more Social Media Management Days – and given that (as promptly pointed out by himself) the afternoon attracted four times as many participants as the first Le Web conference, who knows what this event might grow into in future… watch this space! If you understand French there is a couple of very good conference write-ups to be found here and here (including a video of the Facebook France interview). The recording of the entire event should be available soon on Seeismic website. This post was originally published on the TCS Digital World blog.